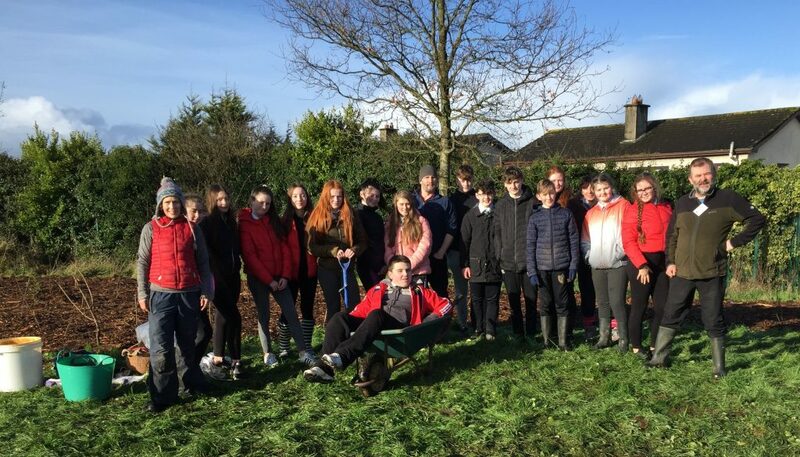 Tiny Forests is a wonderful initiative of LEAF (Learning about Forests) and on the 6th and 7th of February 2019 Thomond Community College planted our tiny forest. There was a palpable air of excitement among the 2nd year Woodwork students as the boots and wellies were put on in preparation for the outdoors. NiamhNi Dhuill (Tiny Forests) and Sean Hartigan from LEAF arrived early. The bark mulch was unloaded as all proceeded to do the first planting. Planting two hundred native Irish trees was the goal. “It’s cool to know that after we leave school the trees we planted will still be there”. Actively learning how to plant a tree. Putting down the mulch as I was so focused on getting it done that I blocked out everything else. Watching everyone race with the buckets and wheelbarrows full of mulch! Teaching the first years to plant a tree. The teamwork and the fun. The final photo with the wheelbarrow. The difference between a spade and a shovel. Roots shouldn’t be showing when you plant a tree. That cardboard comes from trees. Never knew how to plant a tree but now I know!